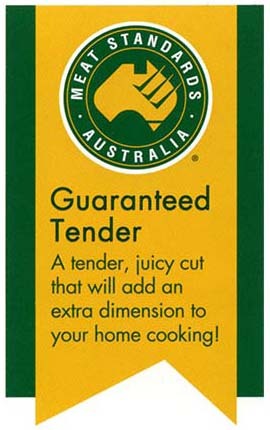 You no longer have to guess whether your meat will turn out tough or tender! The Meal Standards Australia (MSA) program is designed to take the guesswork out of buying and cooking beef and lamb. All cuts carrying the MSA trademark have been graded so you can be certain that, provided the recommended cooking method is used, your beef or lamb is guaranteed to perform consistently well. This means great value for money, because you get what you pay for every time – guaranteed eating quality. Look for the symbol. MSA - graded beef and lamb is only available from specially licensed meat retailers and carries the MSA trademark. MSA beef is a tenderness guaranteed grading program of Meat and Livestock Australia. All MSA graded beef is labelled with a guaranteed grade and recommended cooking method to identify beef eating quality according to consumers. MSA certified graders collate information from the producer, supervise processing standards and collect individual carcase attributes using a uniform set of standards. Individual beef carcase attributes collected include breed content, meat colour, fat depth, marbling, maturity and ultimate pH. Results are allocated to the carcase including individual primal quality grades, days of ageing required and recommended cooking method. For more information on MSA meat grading please read on or log onto www.msagrading.com.